I tell people that the only reason I ended up with Dow was because of these protesters. That’s probably not what the protesters want to hear. I hope their life choices have worked out as well for them as my choosing Dow Chemical for my first and only professional job has worked out for me. I was a chemical engineering major with plans to graduate in the spring of 1967. At that point in life, I hadn’t given much thought to the conservative or liberal political descriptors. I respected their right to protest, but it looked like they were attempting to dictate my life choices. 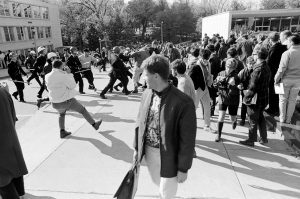 During the winter of 1966–67, individuals appeared outside the Engineering Building protesting against Dow. I didn’t have a problem with that — we all like to express ourselves. It didn’t make sense to me, but that’s OK. For several weeks, they didn’t bother me and I didn’t bother them. Then one day, I was exiting the Engineering Building and a long-haired dude shook his finger at me and verbally ranted about why I should not interview with Dow. I hadn’t even considered Dow as a possible employer until then. But this confrontational edict truly raised my ire. This is America. I respected their right to protest, but it looked like they were attempting to dictate my life choices. I had worked hard for my chemical engineering degree, including holding a part-time job. Having just recently married, my primary focus was on securing my first professional job. Despite the disruption the protesters were causing the Engineering Placement office, I interviewed with Dow without incident. Dow offered me a research position, which was my preferred career path. I accepted and have worked for Dow about 34 years as a full-time employee and six years as a contractor. The topic of napalm never came up in my interview, and I never had anything to do with it during my years at Dow. One of my first activities was contributing to commercializing N-Serve, a growth stimulant to improve crop yields. After about eight years, I became a recruiter for Dow and went on to recruit at UW for about a decade. There were no protester incidents on any of my visits. Today, I’m probably a conservative by most people’s assessment. I’m still good with freedom of speech, I’m just not good with dictating life choices to other people. I tell people that the only reason I ended up at Dow was because of those protesters. That’s probably not what the protesters want to hear. I hope their life choices have worked out as well for them as my choosing Dow Chemical for my first and only professional job has worked out for me. 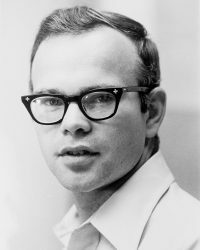 Koch earned a bachelor’s degree in chemical engineering from UW–Madison in 1967. He is retired from Dow and lives in Lake Jackson, Texas.